Hi guys! It sounds like you all really loved Eclipse, huh? Awesome, I can't wait to see it. ^_^ My money is a little tight right now so I haven't had the chance to yet. But I'll get there! Welcome to the EDC, new members! Sorry, I didn't see any names but I could have looked over that. xD It's a little dusty in here, but you'll love it. When we clean out the dust and crickets, we're a whole lot of fun. :3 Carrie has to be around here somewhere, I'm sure she'll give you your official EDC rank as soon as she can. Either way, I better get off the computer for a little while. And shut up before I go too off-topic, hahah. xD Talk to you guys later! Hi Shai, Jay! Welcome to EDC! Raven~ I remember you! A little vaguely, since you posted about twice right after I joined, disappeared, and have been popping in and out, though I remember seeing you on the t(w)een thread. Bree (or Bri? )~ Aw, that's too bad, you'll love Eclipse. Emmett has a big funny line. Liz~ I've been trying to get Fat on, and she told me 'bout a week ago she'd get on that day, but alas, she didn't. hey! I'm Paige... thought i'd join the EDC. Inc ... if it's alright? What was your first impression of Emmett? Emmett seems like that lovable, friendly, protective big brother that every girl wants.. at least i do! I only have little bros so yeah. What is your favorite Emmett quality? What is your favorite Emmett moment and/or quote? What do you think about the casting of Kellan Lutz as Emmett in the Twilight movie? Is there anything you would like to submit for potential topics of discussion? 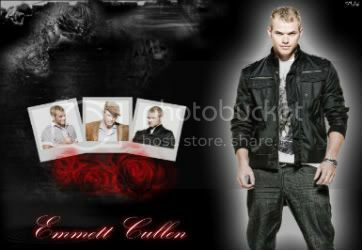 Any last confessions concerning your love for Emmett? But I'm here now, and OMG I LOVED ECLIPSE!!!! Especially the Emmett parts... Kellan really is the perfect Emmett... And I remember someone mentioning Kellan being in Men's Health? Ok! So are we allowed to discuss Eclipse yet?? And if I don't get back on soon, then feel free to haul me over the coals on my yahoo or facebook! Hey guys! Seems like things have kind of sort of picked up. We have two new members, so that is always a plus. Welcome to Aussie, Girlie-Wolf & PuNkk-Rawrr , we love all of our new Emmett fans and welcome to the club. My name is Shannon (2 n's because we have another one with only 1 N, just an FYI) and if you have any questions about how things are run around here feel free to ask. Carrie is the one to give you you're ranking here in the EDC but she has been MIA for a bit so I will let you both know that you are Trainee's in the EDC. You can move up in the ranks by providing comments to the topics/questions that are posted, so the more you post, the faster you will move up. Just be aware that here in the EDC it's all Emmett related. Also, there are those in the EDC that look upon Emmett as the big brother and while others of us look upon him as more then a "brother" or "friend" figure. So, welcome to our little Emmett haven and I hope you enjoy it here and on the the Lex. If you have any questions feel free to PM me. P.S. - Just an FYI, Emmett has been know to pop in along with some of the other Cullens. So just keep an eye open so you don't miss him because he's a riot to talk to and just hang out with. Welcome & hope you have fun here because we all do. Last edited by skylarblue on Sun Jul 11, 2010 10:12 pm, edited 1 time in total. Fatima~ Yeah, the Kellan parts were so good! Paige: Welcome! [: yay! another newbie like me haha. Alright, let's see...seems we need a question eh? Now I know about the Eclipse spoiler rule, but as long as we don't mention what happened in the movie, we're good right?? And of course I remember you Raven!!! How could I possibly forget?!?!?! Fatima~ Wooo Emmett as a new born could be so cool! He was probably freaking strong and the most teriffing from the Cullens...so cool! I think I would have loved to see Emmett fighthing more with the newborns and that's it There aren't too many Emmett parts in Eclipse, anyway..